During the two years between mid 1933 and mid 1935 Rakusan produced a series of 180 individual woodblock-printed fan designs. 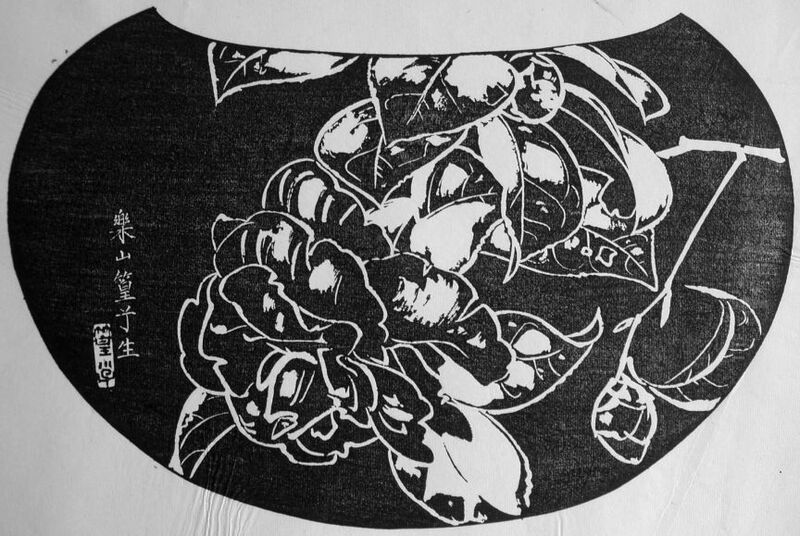 These fan designs are printed as negative images with a single impression of black ink. Although all are actually woodblock prints, this traditional negative-image printing style is called 石摺(り), ishi-zuri, lit. 'stone rubbing', from its superficial resemblance to that technique. Rakusan called this series 篁子生石摺画選, Koushisei Ishizuri Gasen, lit. 'Koushisei's Stone-rubbing Print Selection', but it is usually called here the Fan Series. Rakusan arranged the Fan Series prints into shared-subject groups typically consisting of one design in each of five different fan silhouette shapes. Each of these groups of Fan Series designs are united by a corresponding polychrome 36 Series design which defines the subject. Each shared-subject Fan Series group and its 36 Series design together comprise a theme (画題, gadai). Rakusan did not include the Fan Series in his main sequence numbering. Therefore, the original number used for each of the 36 Series prints has been modified to identify the Fan Series members of its theme. The five different fan silhouette shapes have been here assigned arbitrary numbers 1 through 5. To indicate a fan design these shape designations are added to the 36 Series number separated by a hyphen. 129-2 is the Fan Series design with fan shape 2 in the 129 Double Camellia theme. Like all other designs in this series, 129-2 was only produced in a single print run, and few copies are currently documented. The 129 Double Camellia theme is one of the many entirely regular themes represented by a complete fan quintet and a color woodblock print. The Fan Series prints of the 129 Double Camellia theme were distributed in early 1935 in installment ten (of twelve), but the delivery documents for installment ten remain to be discovered. The series as originally announced would have seen this installment published in October 1934. However, with documented delays the earliest month it could actually have been delivered is January 1935, and it may well have been even further delayed. The woodblock prints were likely printed during the same month as their distribution. The prints in the 129 Double Camellia theme represent two distinct carving periods. Two of the five fan designs (including 129-2) have seal C which indicates a carving date during the first half of 1934. Despite the early completion of those wooden blocks, Rakusan delayed printing and distribution of the prints in what became the 129 Double Camellia theme until the following year. It was eventually grouped with other spring season themes nearer to the end of the series. The other three fan designs and the 36 Series 129 have seal B which indicate a later carving period closer to the time of publication. 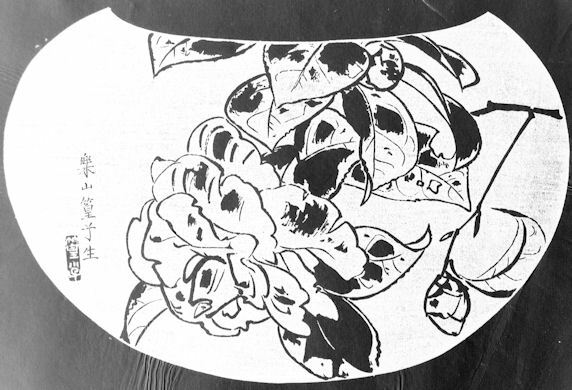 At least some of the double camellia designs in this theme were adapted from sketches originally created in the late 1920s during the planning of design 26 in the earlier 100 Series (see below). The composition of 129-2 includes a single forking camellia branch with a fully open flower and two terminal buds. All of the elements are rendered as line drawings. However, the mottling of the petals and foliage includes solid patches. Both work equally well as ishizuri or reversed. Japanese Camellia, Camellia japonica, 椿, つばき, ツバキ, tsubaki, has been extensively hybridized and selected to modify its flower-form, habit, and blooming time. As the name implies, it is a Japanese native species which still grows wild as well as in gardens. For 129 and the other designs in the 129 Double Camellia theme, and 26 in the 100 Series, Rakusan illustrates a large, fully-double, red and white bicolor flower, of an unidentified hybrid variety. In all of the designs the leaves have an unhealthy looking mottling which appears characteristic of this particular variety. In the title-caption for 26 Rakusan uses the descriptor 八重, yae, lit. 'eight-fold', which is a conventional way of describing flowers with multiple ranks of petals, i.e. a double flower. Therefore, what Rakusan used is a name for a general type of bloom and not the name of any particular variety. From the mid spring season mentioned at 26, and associations with warm weather insects in other designs in this theme, this double camellia variety is the latest blooming of the camellias that Rakusan illustrates. Although he had access to many varieties of camellias, Rakusan depicted only three different kinds in his woodblock prints, and examples of each appear as themes. Links to the other two kinds of Rakusan camellias are at numbers 116 and 126, which in turn link to their own additional related designs.